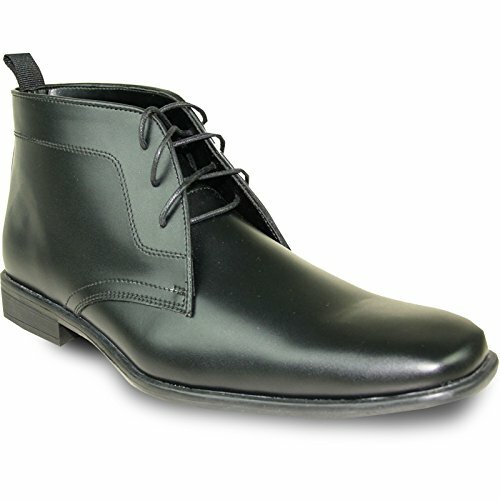 Inspired by An Italian Demi Boot, this Handsome Dress Boot Style is Definitely Cobbled with a Distinguished Gentleman in Mind. With Smooth Synthetic Leather Upper with Elongated Euro Style, This ALLURE MEN Boot is Designed for Wedding, Prom and Other Formal Events. This Upper Material Has Been Treated by a Special Up-to-Date Technology Which is Never Crease, and Scuffing E-Z Clean. Lace-Up Closure Allows for a Secure and Adjustable Fit. Premium Fully Lined Interior Keeps Feet Cool and Dry, and Extra Footbed Provides Support and Comfort. Inspired by An Italian Demi Boot, this Handsome Dress Boot Style is Definitely Cobbled with a Distinguished Gentleman in Mind. With Smooth Synthetic Leather Upper with Elongated Euro Style, This ALLURE MEN Boot is Designed for Wedding, Prom and Other Formal Events. This Upper Material Has Been Treated by a Special Up-to-Date Technology Which is Never Crease, and Scuffing E-Z Clean. Lace-Up Closure Allows for a Secure and Adjustable Fit. Premium Fully Lined Interior Keeps Feet Cool and Dry, and Extra Footbed Provides Support and Comfort. If you have any questions about this product by Allure Men, contact us by completing and submitting the form below. If you are looking for a specif part number, please include it with your message.